With one of the state's most scenic campuses, UNC Greensboro is located in the heart of the City of Greensboro, within a mile of the downtown area. The University's 200-plus acres hold 125 buildings and assorted recreational and athletics facilities and Peabody Park. A 15-minute walk will take you across this Tree Campus USA, a designation provided by the Arbor Day Foundation. 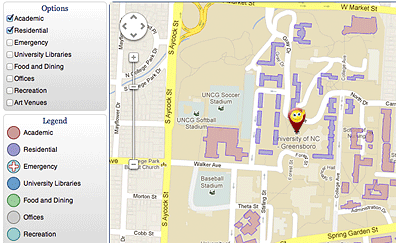 This site provides travel directions for coming to UNCG and maps for getting around on campus. Use the links below for driving routes, parking information, printable maps with alphabetical, numeric and accessibility listings for buildings, and an interactive map that highlights buildings and locations by function. 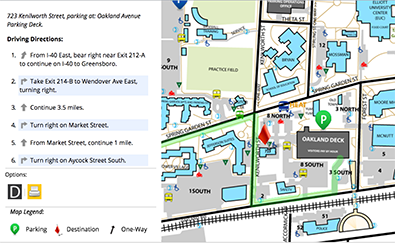 Use Spartan Directions to plot your route to any destination on the UNCG campus and locate the nearest available parking. This interactive map will help you find your way on foot. Highlight buildings, locations for dining, arts venues, and facilities for athletics and recreation, among other features. Printable campus maps in PDF form will help you navigate the campus and provide information on building access.